The past several weeks have definitely thrown me for a loop. As you may well know, my dear mother passed peacefully on January 16th after a brief illness. I would like to thank everyone for your sweet words of comfort - they were truly appreciated. We are trying to find a wonderful home for Annie. If you know anyone in the North Carolina area who could take in a loving sidekick and pass our rigorous pet/owner affection testing, just give me a shout. I'm back home and back in the studio ready to move forward into 2011. This week we're getting back on track with Tuesday's Tutorial as well as our second installment of Featuring Studio Spaces. On Thursday we'll be talking to fantastically talented metal smith and jewelry designer, Jayne Norvelle about her studio and work. If you missed our first interview with Lorelei Eurto, click here to check it out. At the end of the week we'll review with It's a Wrap Studio Saturday. I would love it if you'd like to link up with a review of your week as well. In the meantime, I'll be pulling out my trusty sketchbook and recycled leather to create new eco-friendly goodies for the shop. 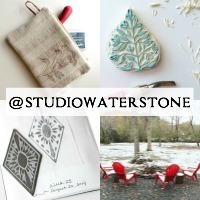 Christmas left Studio Waterstone quite depleted and feeling neglected. I'm gradually climbing back into the saddle and moving forward - slowly, but surely. I would take her in a heart beat but I am in Texas. I will ask around with my blogger and facebook friends. You're such a brave woman Lori! You were in my thoughts the last couple of days. Sending you hugs from far SA. Lori, Somehow i missed the passing of your mother. I'm so sorry ... she was a beautiful woman ... now I know where you get your good looks! Sounds like you're staying on track with those wonderful bags of yours ... like your mom would want you too. Oh, Lori, I am so sorry to hear about your mom. Once again, I am way behind on reading blogs and had no idea. Last I heard you were visiting your mom after her hospital stay. 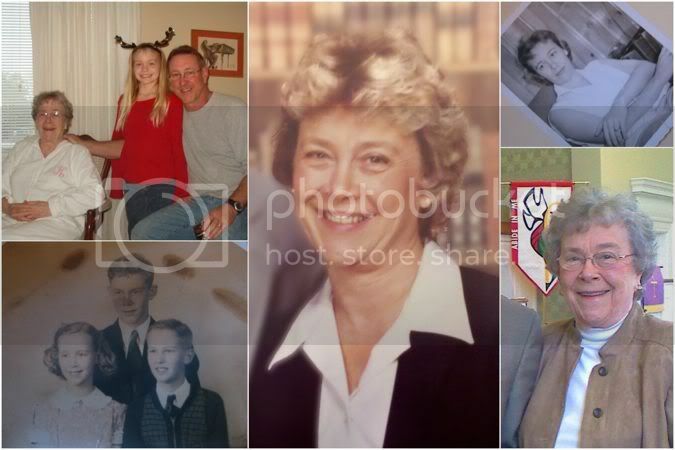 I love your beautiful photo collage in memory of your mom. I see the family resemblance in all 3 generations! So very sorry for your loss, Lori. You are in my thoughts and prayers. Lori,I am so sorry to hear of the loss of your dear Mother. I know what you are going through having lost my Mom several years ago. Thinking of you and your family. Your mother is beautiful! I am sorry for your loss. You and your family are in my heart and prayers. My thoughts and prayers remain with you and your family...even in the middle of the night last night you were held up in prayer. I'm sure you will find someone just right to love the sweet Annie. Lori - have had you in my thoughts and prayers, and hope a good, creative, bag making machine week is ahead! Thanks gal pals! You're just a big bunch of sweeties. Lori- I am so sorry to read about your loss. I'm in Durham, NC; so I'll email around about the cat. I'm allergic, but hopefully I can help you find someone who's not. Lori,so sorry to hear of your loss. I wish I could wrap up a hug and send it to you. I hope you find somewhere lovely for Annie...She must be feeling the loss acutely as well. Lori I am so sorry for you loss. I am glad you are back and know you stay in my prayers. Wishing you well and I am sure you will find a loving home for the kitty soon. je vous présente toutes mes condolences. Does Annie really have to stay in NC? I want a cat named Annie! And of course, more hugs to you! Annie is so sweet and with such a great name she will find a new home soon. 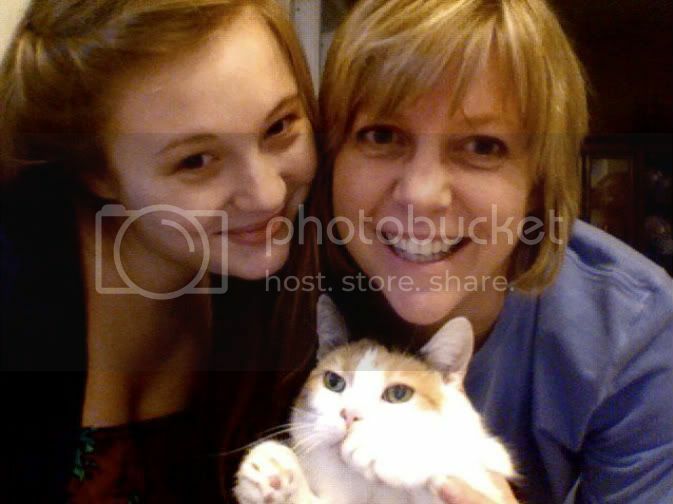 I am so sorry for your loss, thinking of you and your family, your Mom looks like such a beautiful and happy woman. When it rains it pours, we got a call yesterday that Mark's Mom could go anytime, he is in NYC now saying his goodbyes. I am so sorry for your loss. I am amazed that I still think of my father every day since he died and truly miss him. I am sure that it is good to return to your family and work. When my next door neighbor died two weeks ago, I felt guilty returning to my "normal" life. Somehow life keeps moving forward even though it doesn't feel normal anymore. Take care. Lori, I am sorry to hear about your mom. You have been in our thoughts for the last few weeks. The photo collage of your mom is beautiful! Thinking of you and your family! I know I said it in my email, but I'm here for you if you need an ear. This is tough, I know. I'm so sorry for your loss, Lori, you are in my prayers. What a pretty lady she was!